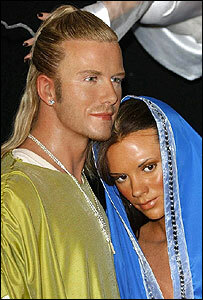 A law lecturer who destroyed a nativity scene at Madame Tussauds featuring David and Victoria Beckham has been conditionally discharged for 12 months. James Anstice, 39, was sentenced at Bow Street Magistrates' Court after pleading guilty to criminal damage. Anstice, from Northampton, had been angered by the use of the famous couple to portray Mary and Joseph, the court was told. The nativity scene was vandalised on 12 December last year. The court was told Anstice had leapt over a cordon at the London tourist attraction, pushed the figure of David Beckham to the floor and seized Victoria's head. He then ran off with the wax head under one arm but it fell to the floor and smashed into pieces, causing damage put at £2,500. Tim Chittenden, prosecuting, said Anstice had paid for his entrance to the museum with a credit card and was soon traced by police. Anstice, who defended himself in court, said he was frustrated that the complaints about the nativity scene had largely been ignored. "It was very difficult to know what to do. I cannot justify vandalism," he said. He added: "There had been very large protests but Madame Tussauds weren't doing anything to review that or respect that. "No church gave me blessing to do what I did but there did not seem to be another way of protesting. "I apologise to the court but I find it very difficult to apologise from my heart to Madame Tussauds." District Judge Daphne Wickham ordered the father of two to pay costs of £55 and compensation of £100. Speaking outside court, Anstice said: "I have nothing against David and Victoria Beckham - I have no opinion on them really. "I have done my bit in the world against crap but I do not think I am going to get involved in any more protests."